You have just bought the latest smartphone in town. You are mighty thrilled but did you know that even the sturdiest phone is not indestructible? Even the tiniest of cracks or a scrape can destroy the appearance of your phone or affect its functionality. 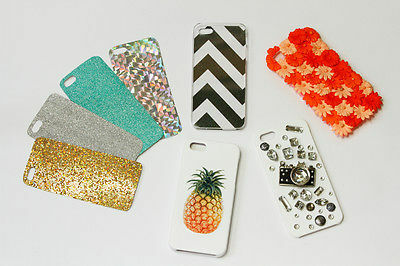 Therefore, it is a good idea to buy a phone cover that is as attractive as your mobile. Check out these online shopping sites to buy phone covers online to suit different occasions. To choose a mobile phone cover that attracts attention as soon as it is spotted, check out the trendy phone covers on Happily Unmarried. Try the Chase Dreams iPhone 6 Hard Case, Selfie Queen Nexus 5 Hard Case or Mood Swings iPhone 5C Hard Case. You can find similar covers for different brands and models, and if your phone’s model is not listed, you let the team at Happily Unmarried know through their website and receive notifications when the cover is available. A fashionista who likes to have a little bit of bling even on mobile covers will love the range offered by Amazon India. Check out the Crystal Rhinestone Cover Case for iPhone 5C (Gold), or BlingIndia Studded Rhinestone peacock theme designer green & blue back cover for iPhone 4/4Sthat can add that extra bit of glitter and sparkle to your mobile. Amazon also offers deals every day, so shop for a phone cover online and you might strike a deal for a steal. If you are someone who loves funky graphics, you would like to own a couple of funky colorful phone covers from Chumbak. Check out some of their phone cases with awesome designs like Chumbak owl, Nimbu Mirch, Tea Cup, Pop Rickshaw etc. Apart from looking funky, these cases provide the sturdy protection required for your smart phones. If you are looking for a phone cover that matches your professional look, then try a leather mobile cover. You can find great options on leather mobile covers to match that formal look on Snapdeal. For example, the Excelsior Brown Premium Leather Wallet Flip Cover Case for an iPhone 6 has the appearance of a leather wallet with 2 card holders. It also offers a stand function to place the phone on your desk while at work. The Bollywood movie DDLJ was in the news recently for having its final screening in a theater in Mumbai after completing a run of 20 years. This movie has a special place in the hearts of Bollywood fans the world-over. Bewakoof.com in association with official YRF merchandise presents the DDLJ London mobile cover that SRK fans might surely want to adorn their mobile with Bewakoof.com has an impressive website that features mobile covers for a range of brands and models. Brands and models of mobiles may differ, but every mobile needs a cover to protect its sensitive screen. The sites listed above guarantee a wide range of choices for you to choose from. So get ready to give your phone a makeover. Previous Post: How Can Interactive Learning Help You To Grasp More?